What a CybHER year it has been! As we continue to follow our mission of empowering, motivating, educating, and changing the perception of girls and women in cybersecurity and have a great mid-year report to share with you! Between Summer and December of 2018, 23 outreach events were held for 2,371 Kindergarten through 12th grade students. 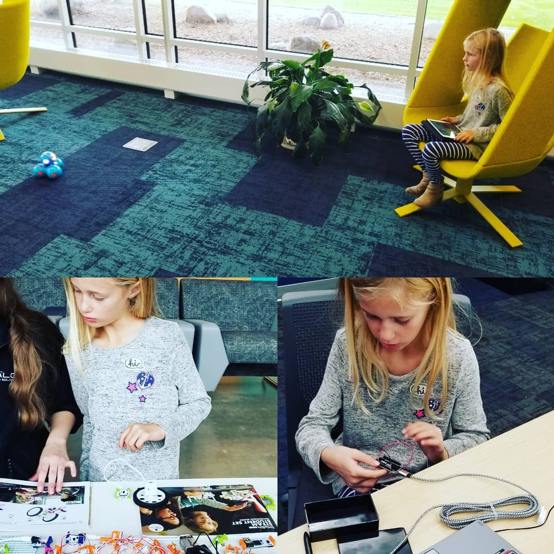 Twenty-seven CybHER student volunteers helped with these events that ranged from Escape Room-style activities teaching about cryptography to working with robots, building smart devices, learning just how much information we give out online, and more. These events were held at locations around South Dakota including Yankton, Sioux Falls, Estelline, and beyond. A total of $3,500 in DSU scholarships were given out. Two of these scholarships were awarded in August 2018. Three scholarships were awarded in January 2019. Two additional scholarships were awarded to K-12 teachers for technology advancements in their classrooms. A GenCyber Grant was also received last year that continues to positively impact CybHER’s mission and influence on increasing diversity by introducing more girls and women to cybersecurity. As we look towards the future, we have $239,900 in pending funding that will allow us the possibility to continue and expand our reach and impact with all of our programs: CybHER Seconds, CybHER Minutes, CybHER Hours, CybHER Days, CybHER Together, and CybHER Camp. To stay up-to-date with all that CybHER is doing, please be sure to follow us on social media and visit continue to visit our website.